1. 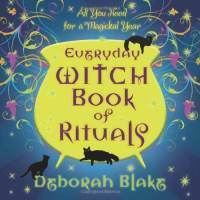 What made you decide to write “Everyday Witch Book of Rituals”? Mostly popular request! I’d begun to think I’d said everything I had to say about the modern witch’s practice, but people kept asking me for rituals. In addition, I’d always wanted to write a follow-up to my first book—Circle, Coven & Grove: A Year of Magickal Practice. One of the things I loved about that book is that it made a year of Pagan practice easy by giving you everything you needed to celebrate full moons, new moons, and Sabbats…but it was designed mostly for covens (witches working together) and I wanted to write one that was aimed at both solitaries and group witches, and had a little something added. 2. How do rituals differ from spells? A spell is simpler—usually a kind of prayer or request or putting intentions out into the world (sometimes rhyming, sometimes not). They’re often fairly short; anywhere from two lines to twenty or forty. A spell is often used at some point during a ritual, although not always. 3. How does “Everyday Witch Book of Rituals” differ from one of your early books, “Circle, Coven, and Grove”? As I said before, CC&G was a book for coven practice, while Everyday Witch Book of Rituals is aimed at everyone (although lots of solitaries told me they used the earlier book and loved it anyway). There’s also a lot more detail about why and how we do rituals, as well as rituals for special occasions like handfastings, Wiccanings (child blessing), eldering, passing over rites and more. And, of course, some sage advice from Magic the Cat. 4. What was the most difficult part about writing a book of rituals? 5. What do you hope readers take away from “Everyday Witch Book of Rituals”? I hope they get a sense for what ritual can add to our lives in a spiritual sense, as well as how useful rituals can be to celebrate the magickal year. 6. What other books would you recommend for readers wanting to learn more about working with rituals? There are lots of great books out there with rituals in them, and few that are focused entirely on rituals. If you are a beginning solitary, Scott Cunningham’s Wicca: A Guide for the Solitary Practitioner is a good one to start with, if you like more ornate and complicated rituals, you should take a look at Raven Digitalis’s Planetary Spells & Rituals. Another couple of good ones are A Year of Ritual: Sabbats & Esbats for Solitaries and Covens, by Sandra Kynes and Dorothy Morrison’s Everyday Moon Magic: Spells and Rituals for Abundant Living (anything of hers is great, really). 7. Readers may or may not know that your cat, Magic, generally helps with most of your work. How much input did Magic have in this book? She wrote a section on how to practice rituals with a familiar, which she considers to be the most important part of the book. Other than that, she did her usual fabulous job of sitting on the back of my chair and supervising me as I wrote. It is a well-known fact that I am not, in fact, capable of writing without feline supervision, which is why you will never find me typing away in a coffeehouse. 8. And as long as we have Magic’s attention, who is Magic’s favorite cat: Garfield, Sylvester, or Tom (of “Tom and Jerry” fame)? 9. Do you have any other projects that my readers can look forward to? I am currently working on my seventh book for Llewellyn, tentatively titled “A Broom for Every Witch.” It is all about the different kinds of broomstick magick you can do, as well as everything you ever wanted to know about brooms. I’m having a lot of fun writing it, and can’t wait to share it with everyone (probably late in 2014). In the meanwhile, if people haven’t read my fiction, they can find my ebook, Witch Ever Way You Can, at Amazon, B&N, and Itunes. And yes, there’s a witch in it! I don’t think I can pick a favorite. There is a lot of stuff I like at Panera. When I’m forgetting calories at breakfast I go with a Cinnamon Crunch bagel, and I love when they have the seasonal Trail Mix bagel! Lately I’m in love with their version of the BLT which is bacon, lettuce, and tomato, but also avocado and turkey too! Seriously, you need to keep this girl AWAY from Panera! But when I come to see you, I’ll be sure to have some. Maybe later this month? Deborah Blake is a Wiccan High Priestess who has been leading her current group, Blue Moon Circle, for many years. 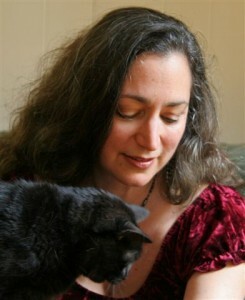 She is the author of six books on modern Witchcraft from Llewellyn Worldwide, including The Goddess is in the Details: Wisdom for the Everyday Witch, Everyday Witch A to Z Spellbook, Witchcraft on Shoestring and Everyday Witch Book of Rituals.. Deborah was a finalist in the Pagan Fiction Award Contest and her short story, “Dead and (Mostly) Gone” is included in The Pagan Anthology of Short Fiction. She is also the author of Witch Ever Way You Can, a paranormal romance featuring…of course…a witch. She is represented by agent Elaine Spencer of The Knight Agency. When not writing, Deborah runs The Artisans’ Guild, a cooperative shop she founded with a friend. She lives in a 100+ year old farmhouse in rural upstate New York with five cats who supervise all her activities, both magickal and mundane.